Initial interest in a quilting group was expressed at a Newcomers Meeting and took form as an evening friendship quilting group, which met in members' homes. The overwhelming interest forced the group to gather in area libraries beginning in September, 1993. The group, with a membership of only 14 members, was named the Fort Wayne Quilt Guild for a short period. In October, 1993, the official name became Appleseed Quilters Guild. After meeting at a local high school for a year, the Guild moved to the American Red Cross building in 1994. To help repay the kindness of the Red Cross, Appleseed Quilters Guild yearly donated a handmade quilt to assist the Red Cross with their fund-raising efforts. The first year, 1994, the donated quilt brought in $750 at the Annual Auction. Guild members also made Pin Parks for the Red Cross to sell at their conventions. In summer of 2009, a decision was made to change the meeting location from the American Red Cross to the Classic Cafe Event Center due to the growth of the guild membership. We had outgrown our previous meeting venue. The format of the Guild is participatory and educational in nature. Philanthropy is important, as well; the affiliation with Camp Watcha-Wanna-Do began in 1993. Annually, the Guild donates more than 100 quilts to children who have been diagnosed with cancer or a brain tumor. Quilts are also put in the Oncology Center for children under treatment. The growth of the Guild necessitated the incorporation of it as a 501-3C corporation in 1995. In the first year of its organization, the Appleseed Quilters Guild planned and sponsored Gathering V, which was held at Pierre's. We hung our quilts at RSVP Shows from 1994-2006. 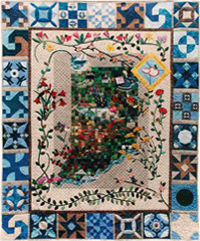 Members sponsored and produced the Gathering of Quilters at the Scottish Rite facilities in Fort Wayne in March of 2000, and in 2002, the Guild presented The Three Rivers Quilt Festival, a quilt show that brought entrants and participants from all over the United States. The Festival was a success, and Appleseed Quilters Guild was able to donate $1,500 to Parkview Hospital Cancer Research Center. Successful shows were also held in 2004, 2006, 2008, and 10 percent of the profits were given to local charities. The membership has made quilts for SCAN (Stop Child Abuse and Neglect), the Police Department (homicide victims quilt), the Red Cross (annual auction fund-raiser), the Methodist Church, stillborn babies (Parkview Hospital), the Binky Patrol (children who are victims of fire or accidents), the Post Office (necktie-quilt fund-raiser), Vincent House (homeless), Charis House and the Women’s Shelter (abused women and children), Lutheran Hospital's Pediatric Ward, and several other organizations and individuals. In 2000, the Guild made multitudes of blocks for the “Thank You Mamm” mammogram quilt at Quilt America. The Guild currently has more than 100 members, who come from all walks of life and include all ages and socio-economic groups. Their love of and interest in quilting joins them. Appleseed Quilters Guild was the proud recipient of the Sam Hanna Award in 2003. This award is given for the contributions to community development and promotion of tourism to our city.